In which we review the quiet and, I now discover, partly sad, life of my 3x great aunt, Esther Maria Backler. In previous posts I have mentioned Esther, very much the youngest child of Samuel Backler and Mary Pellatt and, I believe, carer and companion to her father in later years. We trace the rather startling facts I have gleaned while preparing this post, about her life, husband and child. A late Backler arrival: Esther Maria Backler was born in West Kensington in 1830 just before her father’s traumatic bankruptcy proceedings in 1831, and ten years after the 1820 births of her sadly-deceased twin siblings Elizabeth and Samuel. Her surviving siblings were her much older sister Mary, due to marry their cousin Henry Pellatt a year after Esther Maria’s birth; Susannah (my 2x great grandmother), aged about 13; and the mysterious (did he exist?) Apsley Backler, said to have lived from 1815-1835. Esther Maria was baptised at Holland Independent Chapel, Brixton, on 26 March 1830, perhaps reflecting the residence in south London of some of her Pellatt relatives, as the family lived in Kensington at the time. We next locate her with her parents, married sister Susannah Boulding and niece (Susannah Mary) and nephew (Apsley Samuel) in the 1851 Census, in Islington, where she is also recorded living with her ageing, widowed father in 1861. During the 1860s, both Susannah Mary and Apsley Samuel emigrated to America, and in the late 1850s their mother Susannah [nee Backler] Boulding (Esther Maria’s sister) was to re-marry and have further children – the topic of a future post. Bankruptcy: How and where did Esther meet her future husband? While preparing this post, I tried a general search on the name of Magnus Christian Abelin, and found startling new information which went some way to explaining how he and Esther Maria met. London Gazette 18 July 1862. page 3623. Magnus Christian Abelin (sued and committed as Magnus Abelin), formerly of No. 33, Sidney-street, Brompton, in the county of Middlesex, and late of No. 14, Angel-terrace, Lower-road, Islington, in the said county, Commission Agent, heretofore carrying on business in copartnership with John Litteyman [Lilleyman] Claypole, at No. 17, Gracechurchstreet, in the city of London, as Commission Agents, a Prisoner for Debt in the Debtors’ Prison for London and Middlesex, having been adjudged bankrupt under a Petition for adjudication of Bankruptcy (in forma pauperis), filed in Her Majesty’s Court of Bankruptcy, in London, on the 23rd of June, 1862, a public sitting, for the said bankrupt to pass his Last Examination, will be held before Edward Goulburn, Serjeant-at-Law, a Commissioner of the said Court, on the 11th day of August next, at the said Court, at Basinghall-street, in the city of London, at one of the clock in the afternoon precisely, the day last aforesaid being the day limited for the said bankrupt to surrender. Mr. George John Graham, of No 25, Coleman-street, London, is the Official Assignee, and Mr. W. W. Aldridge, of No. 46, Moorgate-street, London, is the Solicitor acting in the bankruptcy. By 25 September 1862, the Morning Post reported that sureties had been provided by Mr Joseph Myers of 47 Duke Street, Aldgate, boot and shoe maker; and Mr Bernard Keppel, 89 King’s Road, Chelsea. Neither of these men knew Magnus Abelin – they were approached by a friend of Abelin. Release was granted, and I can find no more about this. Childbirth before marriage: Harold Algernon Christian Abelin (aka Harold Christian Algernon Abelin) was born on 7 February 1865 (registered in Islington 1b 357 MAR 1865, though in later census records, said to have been born in Camberwell). 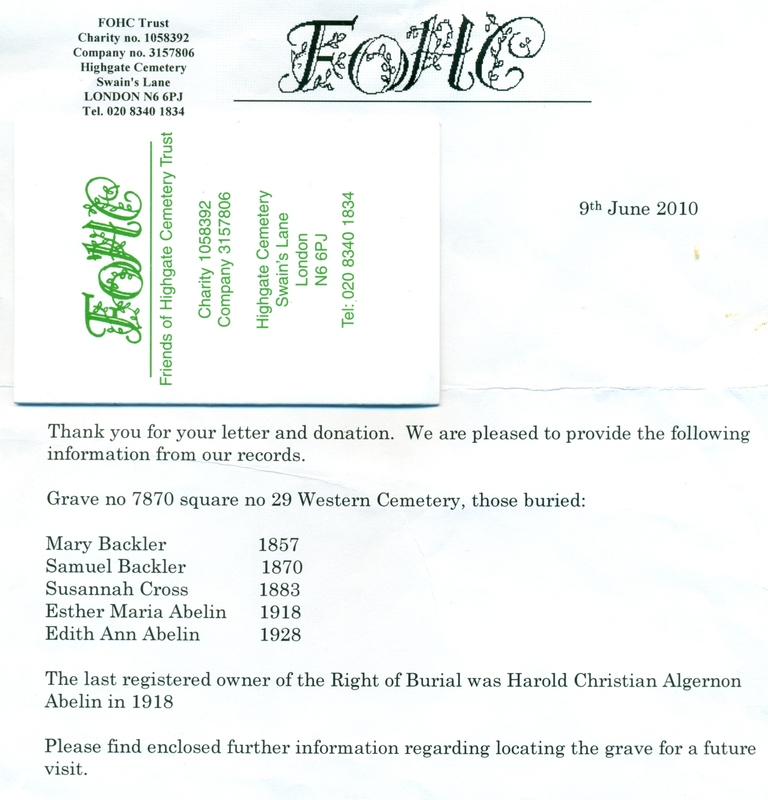 Although this was a few years before the marriage of his father Magnus and mother Esther Maria, the child’s surname of Abelin was recorded in the birth registration record, with the mother’s Backler surname also recorded. I now find that this birth was also registered in Goteberg, Sweden in 1868, showing the birth date as 1865 in Islington. Had the couple travelled to Sweden with their young son before they were married? 23 September 1870: Four months after the death of her father Samuel Backler, Esther Maria Backler, 39, a spinster, married Magnus Christian Abelin, 42, a bachelor, at the Register Office, Camberwell. He was a Metal Traveller, residing at 2 Meeting House Lane in Peckham. His father was Hans Andrew Abelin (deceased), Post Office Inspector, Stockholm. Esther Maria resided at 8 Victory Cottages, Bedford Street, Peckham. Her father was Samuel Backler (deceased), Chemist. Very young witnesses! Witnesses were Mary Ann Bourne and Emily Jane Bourne, whom I believe I have identified in the 1871 Census as scholars aged 12 and 10 respectively, living on Walworth Road, Lambeth as Boarders with their mother Sarah E. Bourne, a 48 year old unmarried Boarder, formerly a dressmaker. As far as I can ascertain, the requirement for witnesses to a marriage was that they be ‘credible’, with no minimum age. The name Bourne does not appear in our family as far as I know, and I do not know why these two would have been witnesses. Could they have been drafted in off the street to the Register Office marriage? As an aside, Mary Ann Bourne, said to be age 12 in the 1871 Census, was married in September 1875, said to be 18, to Frederick Watts. No father is shown on the marriage certificate, and her mother was a witness. Prison again! A sad tale… In 1871, Esther Maria, her husband and son were living as lodgers at The Orchard, Camberwell. But there is yet another startling, and sad discovery. Records at The National Archives (PCOM 2/270) reveal that Magnus Christian Abelin was sentenced at Lambeth Magistrates Court to one month in Wandsworth prison for ‘neglecting to maintain his wife’! This image, viewable on findmypast, shows that 44 year old Commercial Traveller Magnus Christian Abelin, 5′ 7″ tall with blue eyes, was committed on 18 September 1872, and released on 17 October. The record notes he could read and write well, and that he was born in Sweden. More information may be available in other prison or court records at The National Archives. What happened next? I cannot find the family in the England 1881 Census, but I have found a record in Sweden which indicates that Magnus Christian Abelin lived there from 1881-1889, dying on 9 June 1890 and birth date shown as 26 March 1826. (Sweden Household Examination Books, 1880-1920, seen during a free offer period on MyHeritage website.) I can only assume that this is the right person (the ages are right), and I have no way of knowing if Esther Maria and her son were with Harold then. A lengthy widowhood for Esther Maria: Esther appears to have stayed in Peckham until her death in 1918, not very far (but in touch, or not?) from her affluent relatives, the Henry McLauchlan Backler family who lived in Denmark Hill. (See https://backlers.com/2015/06/18/legacy-of-a-gas-man-the-wills-of-henry-mclauchlan-backler-and-his-wife-eliza-nee-cole-backler/ ) She appears as a 50 year old widow, teacher of music, with her son Algernon [sic] age 26, in the 1891 England Census. They are at 39 Choumert Square, Peckham (picture on the left, below), just a few metres away from 23 Chadwick Road, Peckham (photo on the right), their address in 1901. In 1911 they lived over the road in a similar property at number 28 Chadwick Road. 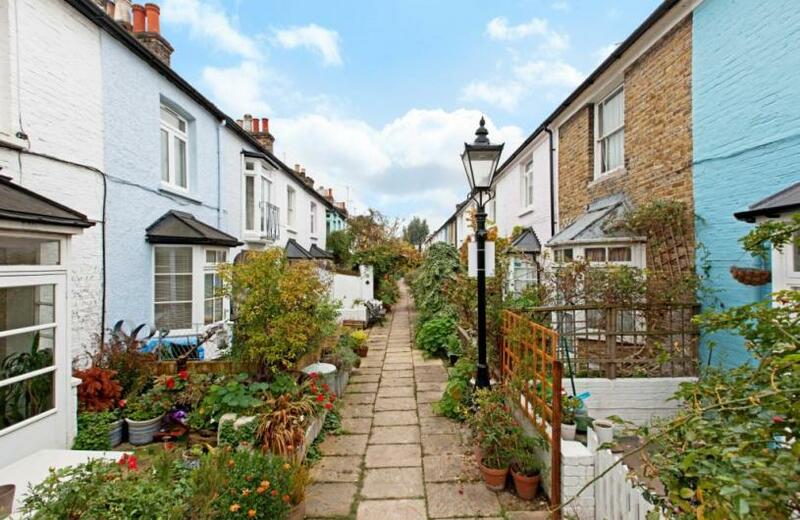 These properties, in a conservation area in the Borough of Southwark, now sell for nearly £1m! A ‘teacher of music’: My great Uncle Bussy (Arthur Boulding Spence) suggested that his grandmother Susannah Backler Boulding Cross (more about her in a later post) was a ‘singer of note’. I have never found any newspaper or other reports which would confirm this, and I wonder if the ‘singer’ was instead Esther Maria Backler, shown in 1891 as a ‘teacher of music’? By 1911 we still find Esther Maria and her unmarried son living at 28 Chadwick Road in Peckham, the address which would be given at the time of her death on 11 February 1918, in Camberwell Infirmary. Administration was granted in May to Harold Christian Algernon Abelin, Merchant. Effect £10. A modest life indeed. 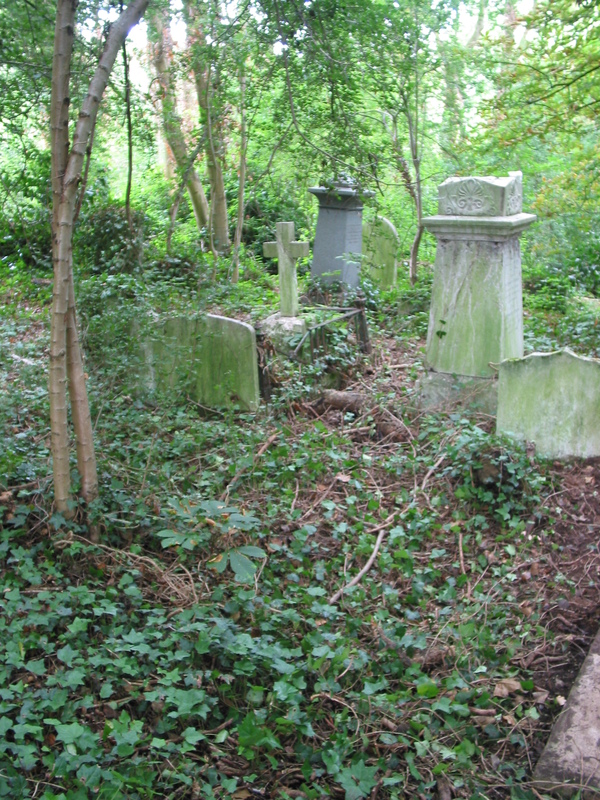 Esther Maria was interred at Highgate Cemetery, about which more in my next post. Algernon Abelin: It would seem that, as his mother had done before, Algernon Abelin lived with and perhaps cared for his mother very nearly until her death. He had married Edith Ann Foster on the 5th of September 1917, just 5 months before his mother’s death and when he was over 50 years old. Had Esther Maria already entered the Camberwell Infirmary? Alas, Edith died in 1928, and on 1 April 1934, Harold married widow Emma Flory Rudder Elliott. 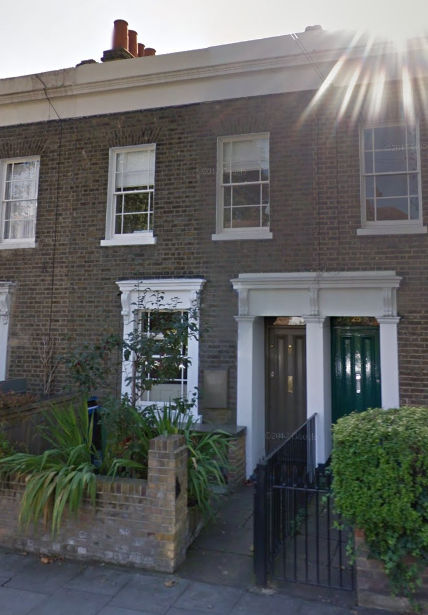 It seems likely they had known each other for very many years, as in 1891 Harold had lived in Choumert Square, Peckham, while 14 year old Emmy Rudder had lived round the corner on Choumert Road. In 1901 Emma was to be found on nearby Bellenden Road with her then husband Louis Philip Elliott and their son, Louis Jnr who later on was shown as a married Explosives Worker living in Woolwich in the 1939 Register. H C A Abelin was referred to a number of times in the journal The Chemist and Druggist, and was shown in telephone directories in the 1920s as A. Abelin & Co., Chemical and General Merchants, at 155 Fenchurch Street in the City of London. When he died on 21 November 1948, he lived at 10 Chantrey Road, Peckham, having been at 11 Chantrey Road with his wife Emma in the 1939 Register. He left effects of £502 11s 4d. Emma died in 1969 in Greenwich. Farewell to an aunt: Alas, I acquire no cousins through this story, but I have found the tale of Esther Maria Backler to be quite moving. Her sister Susannah had remarried in the 1850s after her husband disappeared, and had died in 1883 leaving one son from her second marriage – the mysterious ‘Uncle Fred’, of whom more later. Was he ever in touch with Esther Maria? Her niece and nephew had gone to America. She had wealthy relatives in nearby Camberwell, but I have no evidence that they were in contact. She was not mentioned in any of their Wills. And so we bid her farewell.